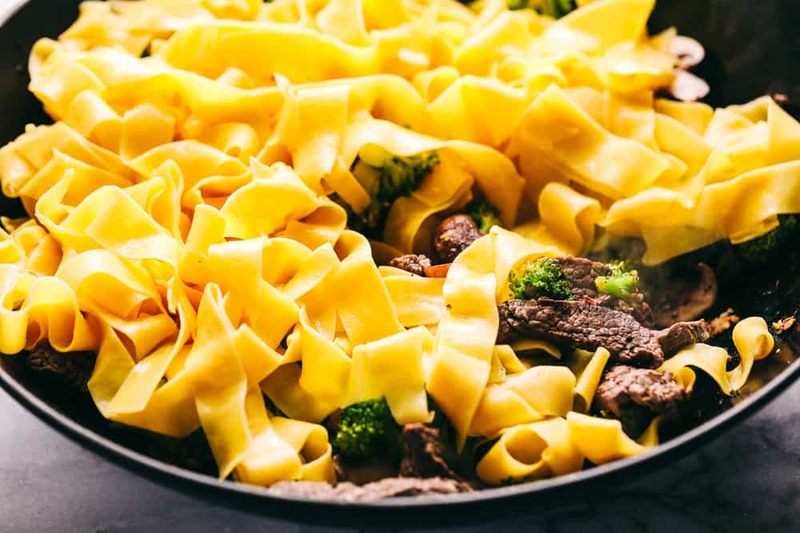 Garlic Beef and Broccoli Noodles is made with tender melt in your mouth beef in the most amazing garlic sauce. 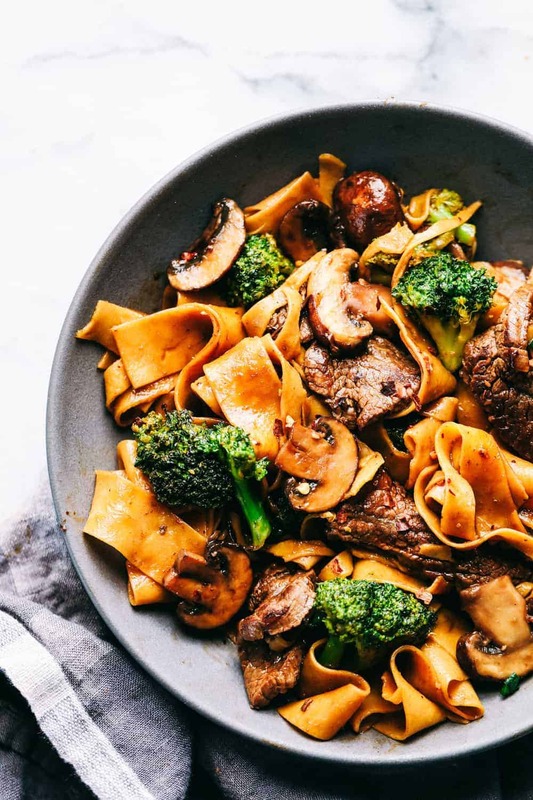 Add some mushrooms, broccoli and noodles for an amazing meal in one! We love anything beef and broccoli at our house. 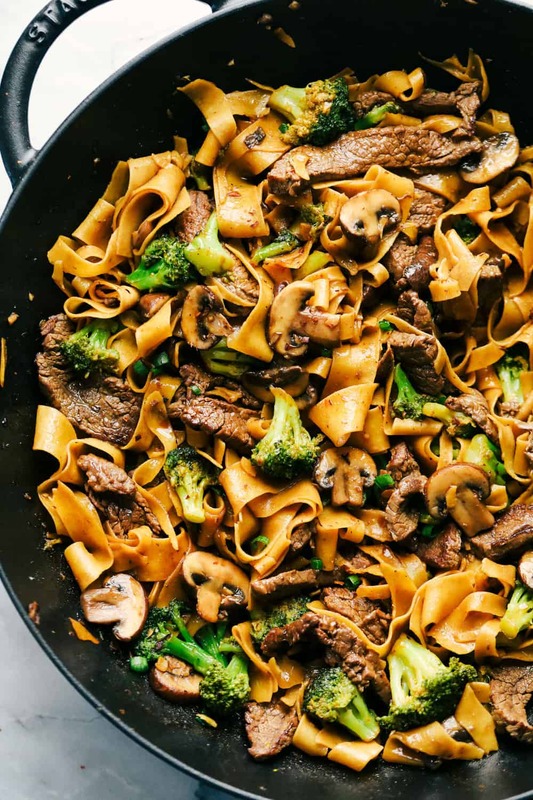 This Beef and Broccoli Lo Mein, Slow Cooker Beef and Broccoli, and Skillet Mongolian Beef are all amazing meals to make! We are seriously obsessed with beef and broccoli at our house. We love asian inspired dishes and this one is a family favorite. You will not believe the amazing garlic sauce that is on the noodles in this dish. Seriously we could not get enough of it! 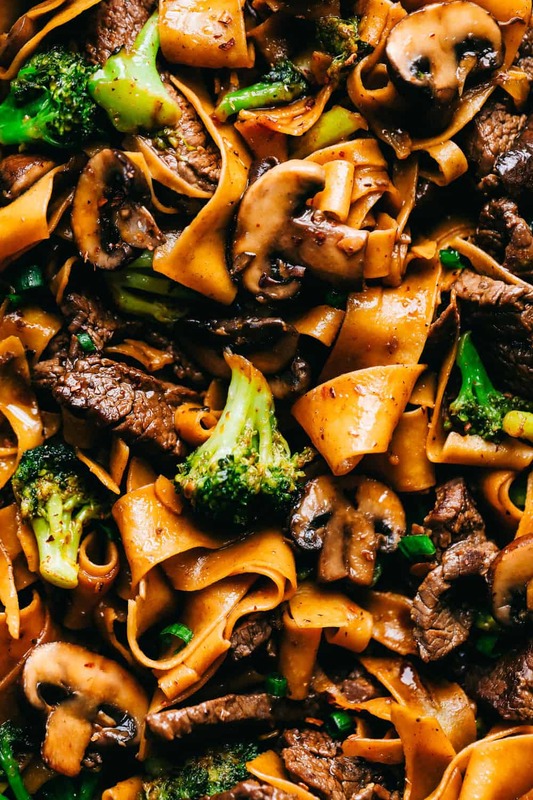 This was a meal in one with tender, melt in your mouth beef, mushrooms, broccoli, and the wide egg noodles. I love that it only requires one pot which makes clean up a cinch! Our family will be making this one again and again! In a with boiling water, cook the noodles according to package directions. Add the broccoli the last 5 minutes of cooking and let them cook until tender. Drain the noodles and broccoli. While the pasta is cooking, add olive oil to a medium sized skillet. Cook the steak until no longer pink. When the Beef reaches its pink color, add the garlic, and mushrooms and cook for a minute more. In a whisk together the brown sugar soy sauce, hoisin sauce, sesame oil, ginger, red pepper, pepper and cornstarch. Add the noodles to the skillet and pour the sauce on top and toss until incorporated. What Beef is used for Beef and Broccoli? I personally like to use Flank steak for my Broccoli and Beef, mainly because its already tender and so easy to cook and it takes little time. but the key to making any broccoli and beef is just thinly slicing the Steak of your choice and against the grain and you should be able to make a great meal. After seasoning with your favorite rub or marinde. Start by making slits along the top, about 1/4 deep and an inch apart. This breaks up the muscle and makes it tender. The trick to cooking the steak is cooking it fast at a high heat. Flank steak gets chewier the longer its cooked. So, cooking it to a rare or medium rare is best. cook for about 3-4 minutes on the first side and finish with 2 minutes on the second side. Looking for more flank steak recipes? Look no further! In a large pot with boiling water, cook the noodles according to package directions. Add the broccoli the last 5 minutes of cooking and let them cook until tender. Drain the noodles and broccoli. While the pasta is cooking, add olive oil to a medium sized skillet. Cook the steak until no longer pink. Add the garlic, and mushrooms and cook for a minute more. In a small bowl whisk together the brown sugar soy sauce, hoisin sauce, sesame oil, ginger, red pepper, pepper and cornstarch. Would like to try this recipe. At what temperature and for how long approx are you cooking the meat? Looks delish! Just wanted to let you know I made this dish for my husband and myself tonight, my first recipe of your ;-), and we thoroughly enjoyed it. It was very good. The supermarket I found myself in didn’t carry rice noodles so I just went with some pappardelle pasta which worked just fine. Look forward to trying some of your other recipes. Thanks! Although the taste of the final product was well-balanced, well-seasoned, and overall very flavorful, the recipe did not turn out nearly the same as I expected it to texturally speaking. 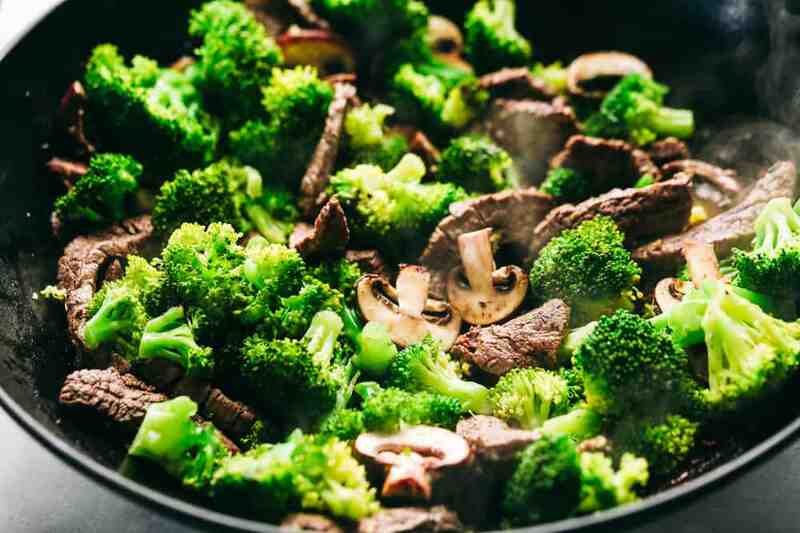 The broccoli was too soft after boiling for only a few minutes with the noodles, and when added to the pan they disintegrated over medium-high heat within a matter of less than a minute. A high heat cooking oil might be a better choice here, such as sesame oil or any other neutral flavored high heat oils. Additionally, the recipe calls for wide rice noodles and from the looks of the picture, wide lo mein noodles are what was actually used. 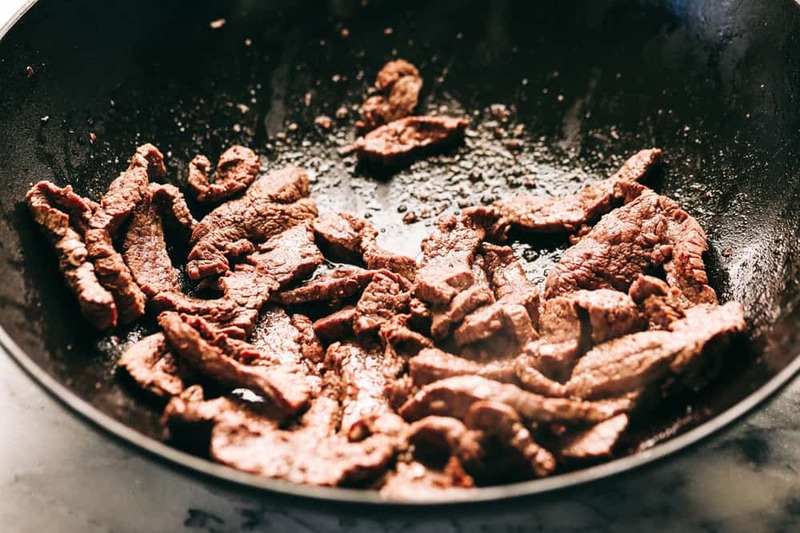 I give this recipe three stars because of great flavor (make sure to use the best beef loin flank you can find) but the recipe definitely needs some major tweaking for anyone making this dish to end up with anything that closely resembles the picture. P.S. make sure to do this recipe in a wok or a large skillet/frying pan with high sides!! I was surprised to find that this was quite sweet. Rather than the salty taste of “beef-and-broccoli”, the hoisin and sugar were a bit too much for me. Definitely an Asian-fusion type of dish that leans towards the non-Asian half of flavor! Looks delicious and can’t wait to try it but am wondering how many does this feed? This will feed 4 to 6 people. Hope that helps! Enjoy! I just made this dish for the first time and it turned out delicious and super easy. Thank you for sharing your recipe.